Viet Nam Tourism Ambassador to France Anoa Suzanne Dussol Perran introduced the “Viet Nam House” project at a ceremony on September 22. Addressing an audience of officials of Paris and the north-central Ile-de-France region and diplomatic representatives, the Ambassador said she has nurtured the project for long with the aim of popularising Vietnamese tourism and cultural heritage among French friends. The Viet Nam House will be built in Hauts-de-Seine province in the Ile-de-France region, to be used as a place to display the quintessence of the Vietnamese culture, such as traditional “ao dai” (long dress), paintings, and gastronomy. Anoa shared her deep feelings when she arrived in Vietnam for the first time in 1992. After that, she lived in the country for 25 years. The tourism ambassador said she will move a Vietnamese traditional house at her An Hoa resort in the southern province of Ba Ria – Vung Tau to France for the Viet Nam House project. The house will be a meeting place for those who love the Vietnamese culture, and her special gift to the two countries, Anoa said. 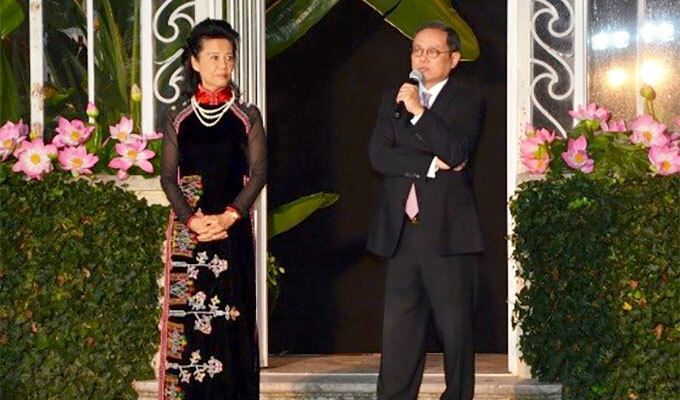 Vietnamese Ambassador to France Nguyen Ngoc Son welcomed the tourism ambassador’s initiative and expressed his belief that the project will help tighten the bilateral friendship and cooperation. French Ambassador to Viet Nam Jean Noel Poirier said the project will bring the image of a Viet Nam both traditional and contemporary to French people. On the occasion, renown Vietnamese designer Minh Hanh staged a fashion show featuring her collection of both ao dai and fashion wear made with traditional brocade of the Mong and Co Tu ethnic groups.